Let me be clear from the outset. I have a political objective as I write this. 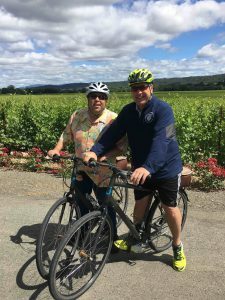 One of my closest friends in the world, Scott Baugh, made a decision not too long ago to run for Congress where he lives in coastal Orange County. I’m hoping that by spending a little bit of time telling you about Scott that you will do one of two things. If you happen to live in California’s 48th Congressional District, I’m urging you to vote for him. Otherwise, if you know anyone who might living in that district, I’m hoping you can drop them a note, or share this. While I have supported many people for Congress over my years of active political involvement, I think it may be since another close friend of mine, Ed Royce, ran successfully for Congress in 1992 that I have felt this strongly about supporting someone for federal office. 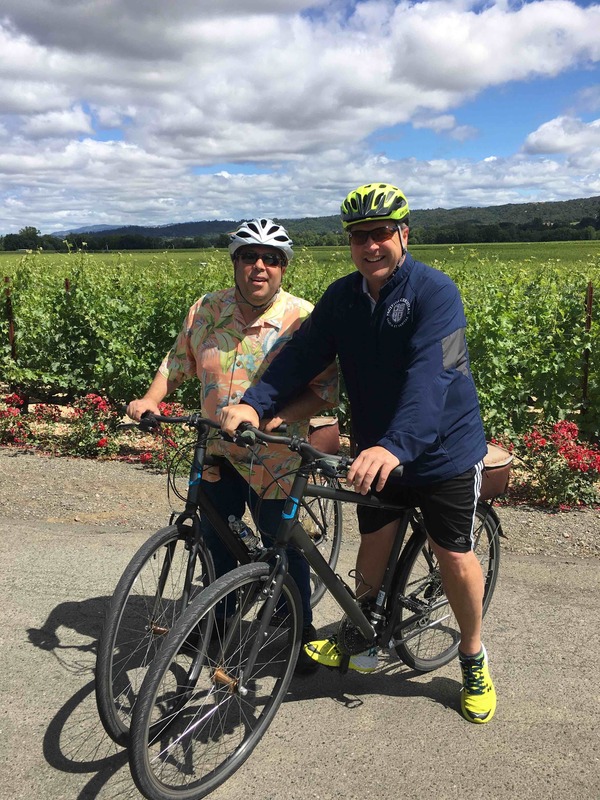 Scott and I on a bike ride with friends in Sonoma County. I first met Scott in 1995 when he ran for office when the entire GOP establishment circled the wagons to recall turncoat Assembly Speaker Doris Allen. Scott ran in the recall election and replaced Allen. Scott went on to serve five years in the State Assembly and as fate would have it just a few years later, during his final term, he would become the Assembly GOP Leader at the very same time that I was Executive Director of the California Republican Party – giving us a unique opportunity to work together. It was such a fun circumstance that it’s worth mentioning. Our friendship has deepened and grown in the eighteen years since then. Looking back over all of these years of knowing Scott, I have come to respect Scott for his zeal, for his intensity, his ability to digest and articulate complex policy and political issues, and his insatiable desire to do good things for other people (whether it is in his family, his faith community, his friends, his community, and now, potentially, his country). I have found Scott to be someone of the highest moral character (you know, the people who do the right thing when nobody is watching, or when everyone is watching), and who is well grounded in his world view. I am so fond of this person who is so genuine in his faith, in his sincerity, and in his love of life. It isn’t often that you are able to meet someone who gives of himself so freely with no expectation of reciprocation. Okay, I will stop with the over-the top effusive compliments of Scott, you get the idea. Politically, Scott and I are very in sync. Scott is a constitutional conservative who is thoughtful and well read. He understands natural law – and is a student of the founding of our nation and the contributions of great American leaders from Madison and Hamilton to Lincoln and Reagan. Because of Scott’s strong spiritual and intellectual underpinnings, he has become very adept at applying First Principles to the public policy arena – something that is sorely needed. He is also very talented at bringing people along with him by patiently and respectfully helping people walk the walk. I saw this happen many times during the decade that Scott was Chairman of the Orange County Republican Party. It was particularly enjoyable to watch him walk people through the importance of the principle, and why the party should be wary of supporting candidates for public office who take contributions from public employee unions. Which is a good transition to Scott and politics. I’m sure many of us in politics today have become more cynical. There are so many disingenuous people in the political world, and so many reasons to be cynical. While only one person, Scott is like a one-person disinfectant to all of that. This is someone who manages to find and nurture the better angels that are in all people — and create coalitions and outcomes that repeatedly cause people to wonder how Scott pulled off the impossible. This is something I have witnessed first-hand so many times. I know that if Scott is elected to Congress, he will be more than just one out of 435 Members of Congress. I know from the bottom of my heart that he will actually make a significant difference in bringing people together to do great things and achieve great outcomes. Well, I could wax on about Scott for a lot longer (maybe I will some other time). But I think that I’ll tie things up here by just reiterating that Scott has been such a tremendously positive influence on me and my life, and I know I am not alone. He would be amazing in Congress and I hope we can get him there. P.S. You can learn more about Scott’s candidacy here. This entry was posted on Friday, June 1st, 2018 at 2:59 pm and is filed under Blog Posts.